Patty: So we really did surprise you? Pop: I had absolutely no idea. Wasn’t until I saw the old neighbors that I knew it wasn’t the “family reunion!” And how did you find so many of my army buddies? Patty: That was Joe’s idea. He spent hours on the Internet locating them. Pop: Well, Patty … you outdid yourself. It’s a night I’ll never forget. You made this old guy very happy! 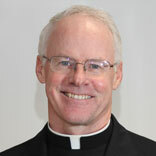 Father John J. Ames is the deputy secretary for the Office for Catechetical Formation for the Archdiocese of Philadelphia. There are so many things to like about birthday celebrations. Sending invitations and hoping everyone will come. Choosing a theme and buying the plates, napkins and table cover. Deciding what kind of cake to make or buy. Hanging streamers and balloons. All the people coming together … bringing colorfully wrapped gifts with shiny bows. People talking and laughing at the party, enjoying the food and refreshments. Playing games. Dimming the lights to sing, “Happy Birthday!” Blowing out all the candles (maybe!). Time for cutting the cake, a scoop of ice cream and opening presents. The saddest part is when people have to go home. It was so much fun! Birthdays celebrate the sacredness of life and fete those we treasure. We are grateful for the day they were born; we rejoice in the fact that they are still with us; and we pray that God will bless us with their presence next year. Though the Birthday of Mary may not be celebrated with the fanfare of earlier centuries, it is important for several reasons. First, the Nativity of the Blessed Virgin Mary is an important date in salvation history. Christ needed a mother, and Mary’s birth is an event without which Christ’s own birth would have been impossible. The Nativity of the Blessed Virgin Mary prepares the way for the birth of Christ. Second, celebrating the birthday of Mary helps make her more real, more human for us. In his “Spiritual Exercises,” St. Ignatius of Loyola refers to “composition of place.” He recommends the use spela roulette of our imagination in prayer. We should gaze, through our imagination, at biblical scenes, sacred people and places. Picture the person, the setting, the sights, sounds and even the smells. The events and people come alive and lead to a more personal encounter with God. This technique can be applied to almost any saint, biblical story, or figure from Sacred Tradition. For example, what would the sights, sounds and smells be in the manger on that first Christmas? What do Jesus, Mary and Joseph look like? What color are their eyes, hair, clothes? Who is speaking and what is being said? The possibilities are as endless as my imagination. We can do the same with the birthday of Mary. Imagine how thrilled Mary’s parents were when they learned that they would have a child. How elated they must have been to hold the little newborn in their hands. Think of how excited Mary was as a little girl looking forward to her birthday party. Using our imagination in prayer can aid in developing a more personal relationship with Mary (and God). Third, the observance of Mary’s birthday is a reminder of the interplay between Sacred Tradition and the Holy Bible. As Catholics, we hold to the truths contained in the Sacred Scriptures. We also accept Sacred Tradition, truths of faith that are not explicitly contained in the Bible but are not contrary to biblical testimony. The Bible does not mention the birth of Mary, nor her parents. However, we are certain that she was born and had parents. For almost 15 centuries now, the Nativity of the Blessed Virgin Mary has been celebrated on Sept. 8, and her parents are identified as (St.) Anne and (St.) Joachim. Tradition provides us with this information. It’s a good example of Tradition complementing, while never contradicting, Scripture. Pop, I am glad you enjoyed your birthday. I hope you enjoy many more. Mary, Happy Birthday! I am still thinking about a gift.